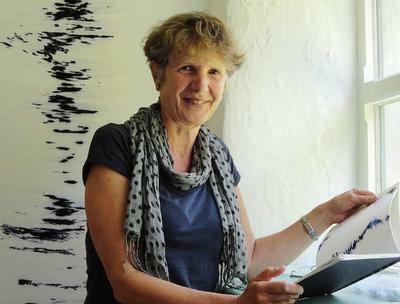 Anglesey artist Helen Grove-White has been chosen to display her contemporary art works alongside the new exhibition, Venezia, which features the late Sir Kyffin Williams, Anglesey's best loved painter. Opening at Oriel Ynys Mon on July 19th, Helen Grove-White will show her contemporary works on the theme of Venice. While Kyffin's show, including works by his predecessors Canaletto, Guardi and Sickert, is called 'Drawn to the Light', Helen has referred to hers as 'Drawn by the Light' in a nice little play on words since her work is literally drawn by the camera as it reacts to the light on the water. Helen has become fascinated, like most artists in Venice, by the play of light on water and has chosen to make this her theme, travelling with pocket camera and flip video on several trips to Venice to see the Venice Bienalle. Not content with mere photographs Helen always extends or alters her images, stimulated by ideas as well as places. The central idea here is that of the digital sketchbook, rather wickedly challenging Kyffin's lack of sympathy for contemporary art and his championing of the traditional discipline of drawing. "I do draw as well", asserts Helen, "but on this occasion it was important that these images were created another way". Little did she imagine that her playful digital drawings would find a place next to Kyffin, giving the gallery goer the chance to see a variety of approaches to a subject. "I never set out to make an exhibition of works on Venice but I have been given the perfect time and place for my collection on this theme." Since graduating in 2005 Helen has shown her work in Ireland, Scotland, England and Wales as well as the USA. She has also become well known in the Anglesey art scene. 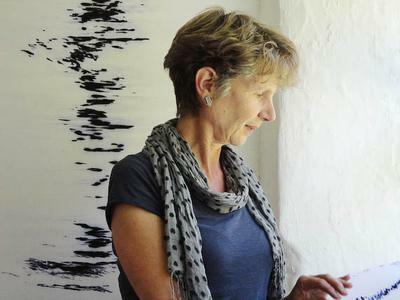 As Vice chair of the Anglesey Arts Forum, she helps to support the network of artists' Open Studios and opens her own studio every Easter for a show of her latest work encompassing video, installation and photographic works. I was pleasantly surprised to find so much useful information on your blog. Thank you very much for sharing your thoughts and discoveries with us. Will keep your blog in bookmarks and`ll look it from time to time. Your posts are really great. I am fresh to acrylics and I in development today with Windsor & New town artist quality paints over picture. I think it is immediately the roughness of the work of art paper, but when I cover over it. This is the main reason of the less development of the most of the country as the people are not capable of utilizing the resources in a best way as they should or as those resources can be used. The post named Island Artist with Canaletto and Kyffin Williams in Venezia was very much inspiring. I would like to know more about Kyffin Williams and Canaletto. Someone please tell more about these persons. I am waiting for a response. I see that this wonderful exhibition can still be visited for the month of January 2014. You can learn about the artists that influenced Kyffin Williams during his visits to Venice. How often do you get a chance to stand in front of a painting of Venice by Monet or Canaletto, Walter Sickert or Frank Brangwyn? And in Llangefni? There is a film of KW in Venice and many of his paintings and his sketchbook. Plus beautiful panoramas along the grand canal, and an aerial view of all the islands. Not to be missed. Wow.Wedi mwynhau gweld gweithiau yr artistiaid a chlywed llais KW ar y fideo. Gwledd arall oedd darganfod bod na Canaletto yn Oriel Mon. Hope you've all had a chance to see the Exhibition at Oriel Mon. Fabulous. Thanks. … and Monet too ! … yes, Monet in Llangefni !! fantastic to have rising anglesey artist with Kyffin Williams, Guardi and Canaletto under one roof! !